Quiltville's Quips & Snips!! : About Bonnie! Bonnie K Hunter is passionate about quilt quilting, focusing mainly on scrap quilts with the simple feeling of “making do”. She started her love affair with quilting in a home economics class her senior year of high school in 1980 and has never looked back. Before quilting becaue her full time career, Bonnie was the owner and designer of Needle in a Haystack!! Creating more than 70 patterns for dolls and stuffed animals with a country primitive feel. 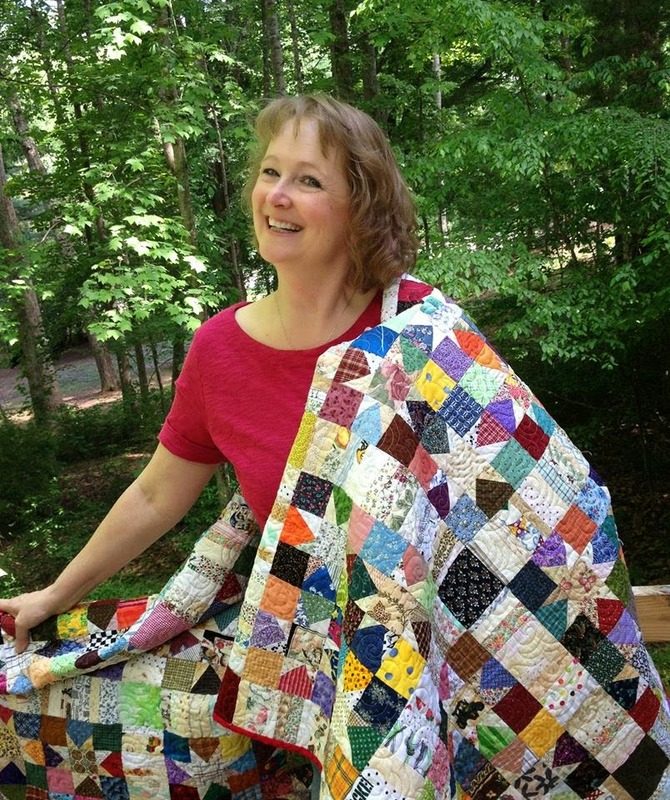 When not traveling and teaching, she spends her time piecing scrap quilts, enjoying the peaceful reward of English paper piecing and hand quilting as much as machine work, and loving life in her wooded surroundings in beautiful rural Wallburg, North Carolina, A suburb of Winston-Salem. She and her husband, Dave are the proud parents of two grown sons, Jason, and Jeffrey. They round out their household with Sadie the dog and three cats –Emmy Lou, who at 18 rules the roost, and two adopted grand-cats acquired when son Jason moved to Portland, Oregon - Dresden and Lola Their antics keep Bonnie constantly amused while she plays happily with her fabric. Life is currently in flux as plans to open Quiltville Inn, a big old victorian house turned retreat center in Southwestern Virginia is underway. Plans are to open in the spring of 2020. Stay tuned! Catch up with Bonnie’s doings through her extensive website at Quiltville.com. There you will find Quiltville’s calendar for lectures and workshops, tips and tricks, techniques, tutorials and a long list of free quilt patterns to help you dig into your scraps. From there, head over to Quiltville.blogspot.com for Bonnie’s (almost) daily blog, Quiltville’s Quips & Snips. Her global Facebook group, Quiltville's Open Studio has become a hot spot for quilters from all over the world with a focus on using scraps and stash. Keep in real-time touch with Bonnie on Instagram @quiltville_bonnie and on her facebook business page QuiltvilleFriends.